Once relegated to the living room or family room, it is almost unheard of to see someone who doesn’t also have a TV in the bedroom. Watching Netflix before bed or leaving Pandora playing in the background while one sleeps is becoming increasingly common. However, adding the space commitment of a TV to the average bedroom doesn’t mean that the bedrooms have become any larger or more spacious. In many cases, the amount of space needed to keep a TV within viewing distance will mean giving up dresser-top space or constraining other space necessities in the bedroom. 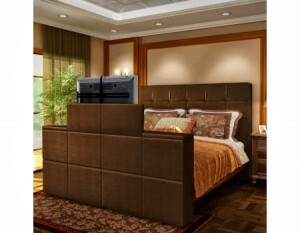 TV Lift Cabinets recommends a foot-of-the-bed lift to increase this space. Several of our foot-of-the-bed lifts and TV lift cabinets are designed with simple, elegant décor in mind and are ideal for maximizing space and reducing clutter. We offer hundreds of designs that feature clean lines and natural accents to blend into the rest of the room and not distract your eye when the TV is not actually in use. These particular cabinets are designed with minimalism in mind and are perfect for a small space, or even a larger bedroom that seems cluttered with a more complex design.